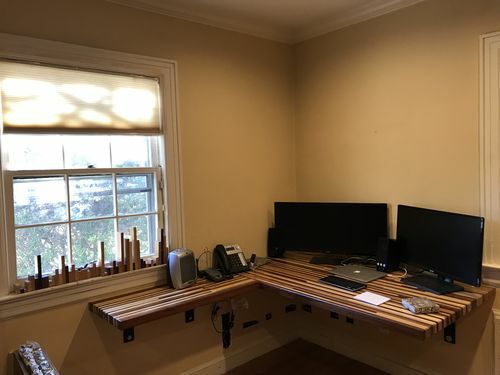 I just finished a floating desk made from walnut, mahogany, oak and maple—pictures below. It is 2” thick and I am going to make two drawers from 1/2” ply that I will install under the desk to hold papers and stuff. I am deciding on how to face the drawers. 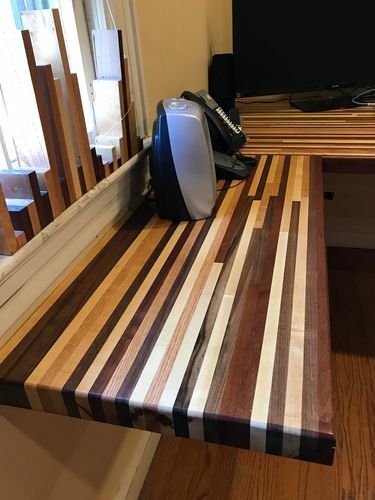 The desk came out great and looks super sharp and I am thinking about how to make drawers that go along with the sharp look. 1. wrapping the walnut in maple, mitered at 45 and maple drawer pulls. 2. Maybe doing some kind of edge treatment with a router bit? I’ve never done that before so any suggestions or links to bits is appreciated. Happy to accept additional suggestions. Pictures and links are always helpful.